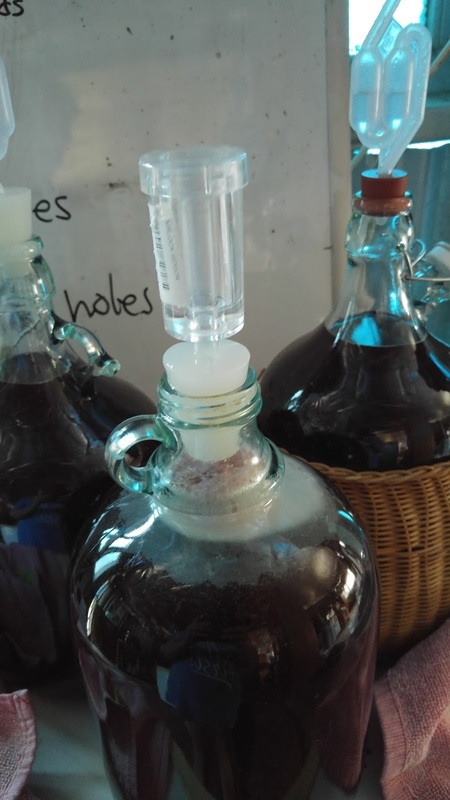 Over the last three months or so I have been learning to make wine. Several people have expressed the opinion that my timing is not great; given that I am learning to drive at the same time. You don’t have to worry yet though…wine making is a long, slow process. Having always been interested in the process of fermented foods (or transformation in any guise really) I began by learning to make sourdough bread. This led to thinking about how wine is really just rotten fruit water (that tastes good) and how amazing that is. After a lot of reading on the internet and a visit to the local library I was ready to get fermenting. Wine makers seem to range from those who elevate the process to an art or a science to those who accidentally left some juice out and found it had miraculously become wine by the time they got around to cleaning the kitchen. I figured that since we have been making the stuff for the last 6000 years or so, you probably don’t need to build a lab to do it. 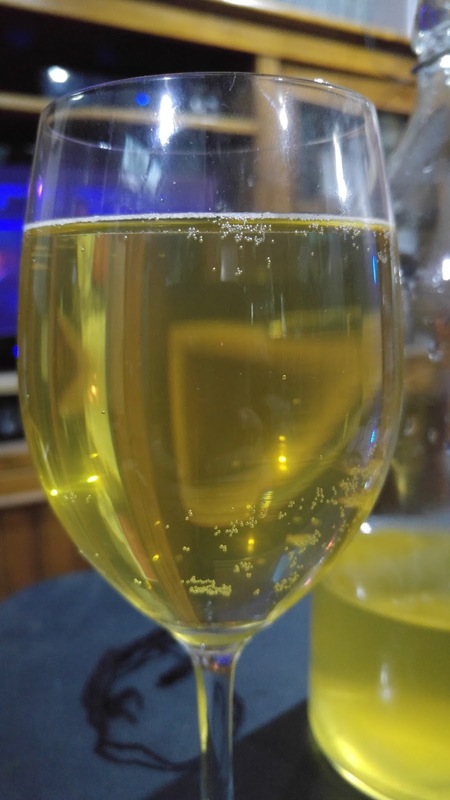 My first batch was apple cider, made from store bought apple juice (so I could get an understanding of the process). 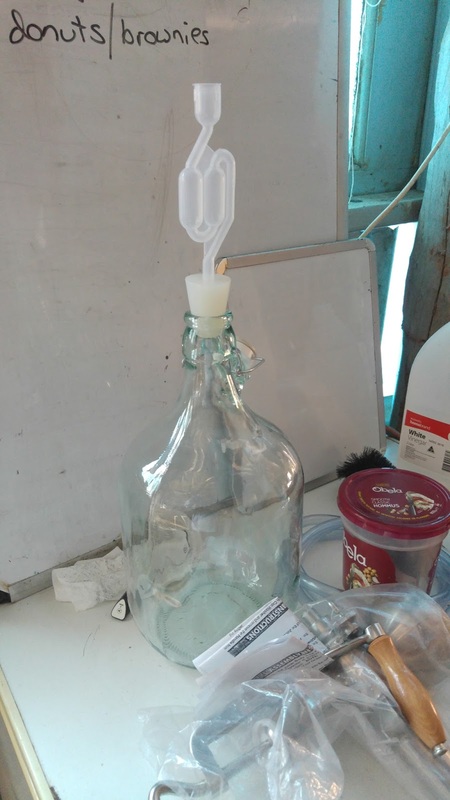 A demijohn (big glass bottle), some yeast, Campden tablets and a bung/airlock were duly ordered from an online shop and when they arrived I began the learning journey. 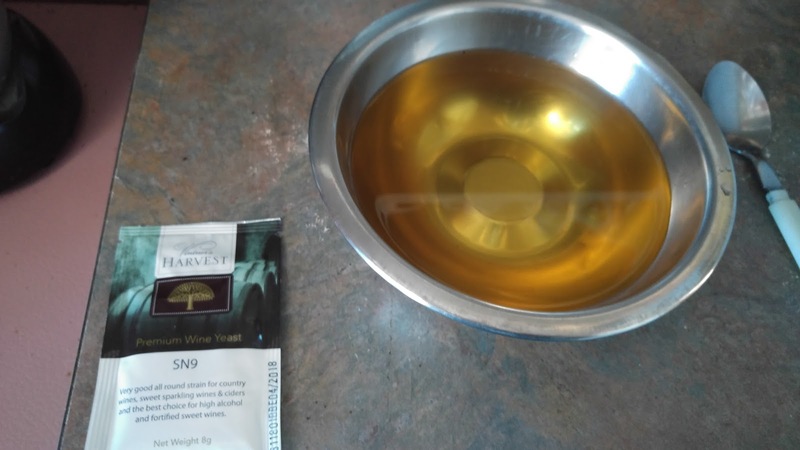 I didn’t photograph that first batch (or the honey mead and the blueberry wine that came after) so I thought I would show you the process with a new batch (and because putting a new batch together is just so exciting I will take any excuse to make more wine). This batch is made from store bought juice again, I used grape juice with a little bit of apple thrown in for flavour. The only immutable law in wine making is that everything (and I mean everything) has to be clean and sterile. 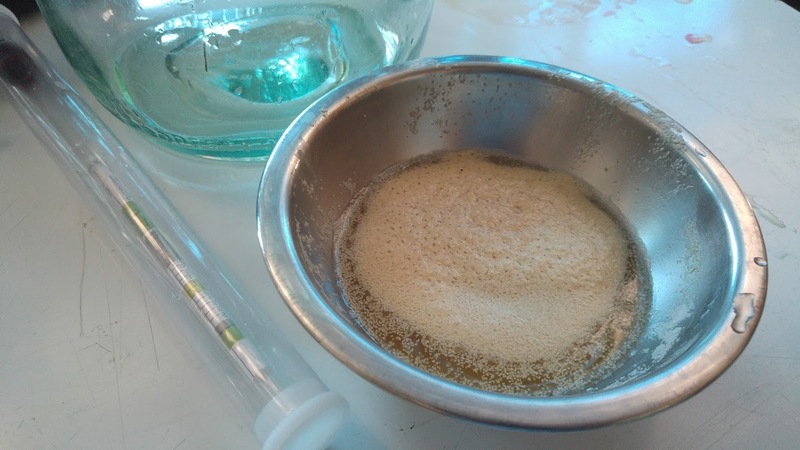 I made up a sink full of sterilizing fluid by crushing two Campden tablets and dissolving them in water. 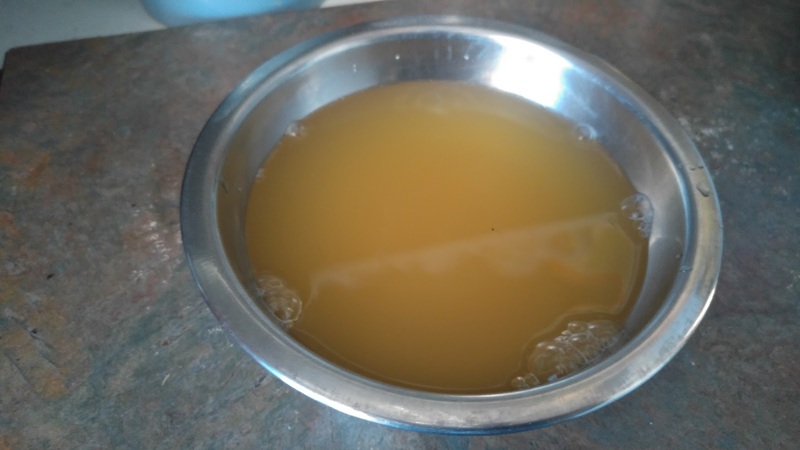 I was a little worried about using sodium metabisulfite (which is a sulfur based material) in our system as anything designed to kill yeasts and bacteria will affect the health of soil and water. However the risks are very low when using it as infrequently as I do. I didn’t take a photo of the sink (you all know what that looks like). 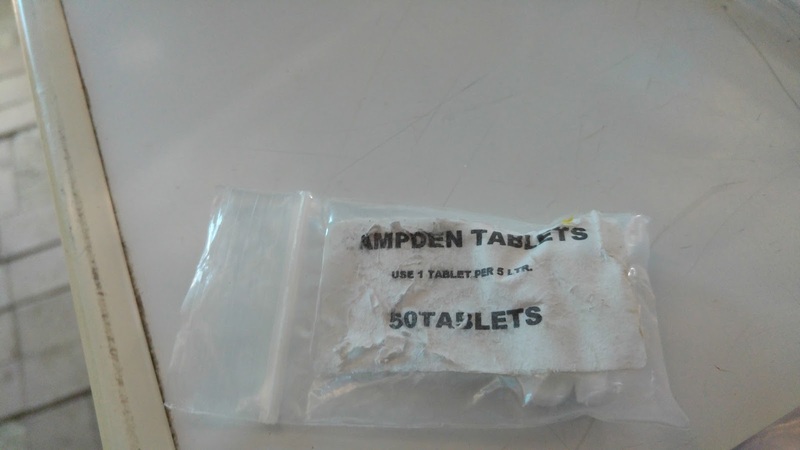 This is my beaten up pack of Campden tablets. After everything is sterilized (equipment, counter tops, hands, stray pets) it is time to activate the yeast. 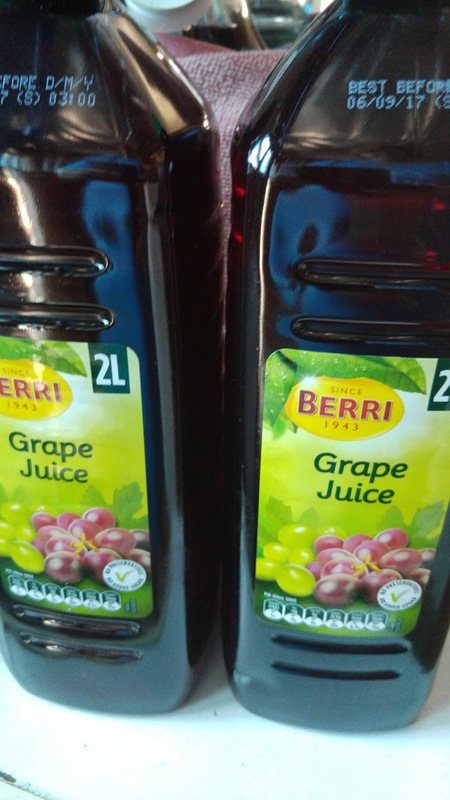 This is just a matter of mixing the yeast with warm water and fruit juice in a cup and putting it somewhere it won’t get spilled. 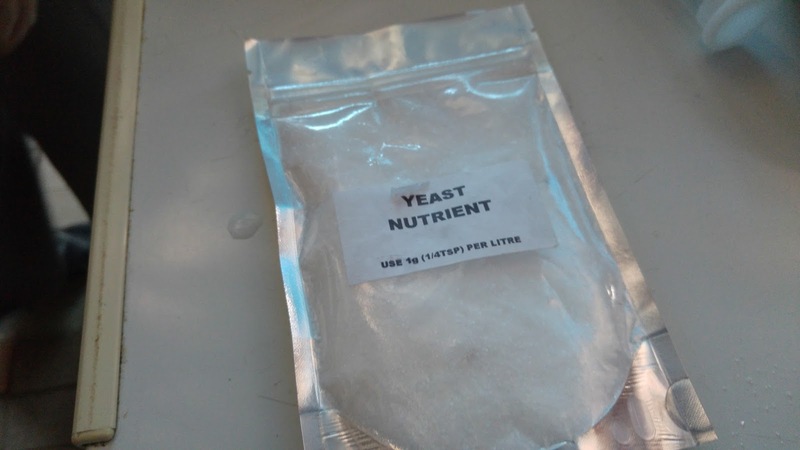 Wine yeast is sold in neat little sachets containing dehydrated powder. When the yeast is mixed with liquid it starts to wake up and look for food, just what you want in a yeast. My neat little yeast sachet and a bowl of apple juice and water. This is the yeast when it is first mixed into the juice. This is the yeast after about half an hour. Some is missing because I forgot to take a photo before beginning to pour it into the juice. Next the juice (or fruit mush) is mixed with sugar in a pot on the stove, I used five cups of sugar in this batch. 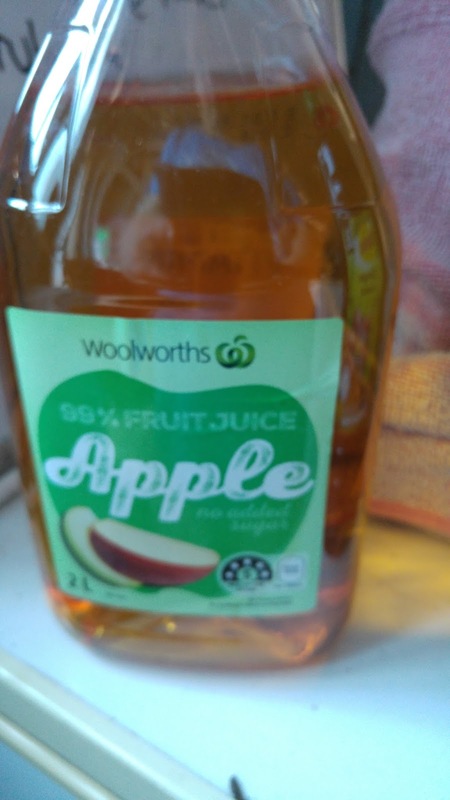 I heated the juice gently and stirred (not so gently) to dissolve all the sugar. When all the sugar was dissolved I poured the lot into a sterilized demijohn, added a teaspoon of yeast nutrient (don’t ask me what that is, the books said I needed it) and popped on an airlock and bung. Most web sites recommend taking a specific gravity reading with a hydrometer before you pour in the yeast. I bought a hydrometer to do just that, then forgot to use it. Next time I will definitely do this though as it apparently gives you a better idea of how alcoholic the final product is. I guess for now I will have to rely on the tipsy test (you know…how many glasses does it take to make you tipsy). The airlock and bung are the funny bits at the top of the big bottle. Airlocks let gas escape but don’t let gas in. 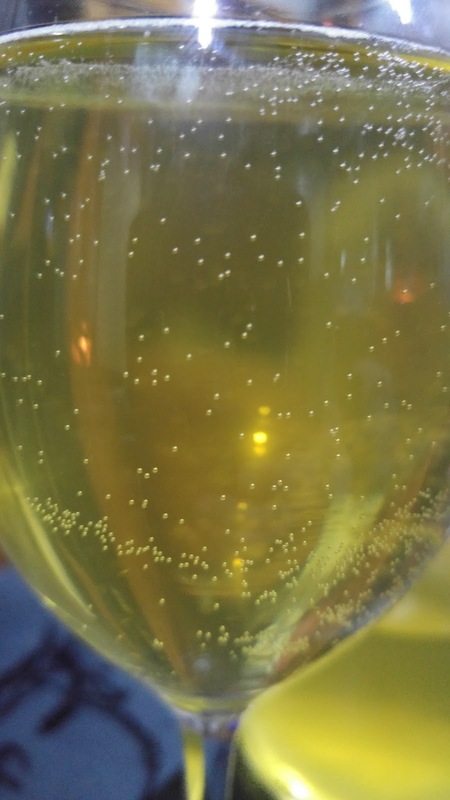 The general idea is to wait until the bubbling stops (between days and weeks) then rack the wine into a clean, sterile demijohn with a new sterilized airlock leaving behind the dead yeast (called lees) which forms a sludge in the bottom. I use a food grade hose (sterilized of course) to siphon out the good wine but leave the lees behind. The wine is left in this demijohn for another month or two until it is clear (apparently you should be able to read through the bottle) then bottled and stored for a further few months or years. After all that you can open a bottle and have a taste. This is the batch, bubbling away producing alcohol. My first batch of apple cider. I started it three months ago and opened my first bottle with a friend a week or so ago. As you can see, the process of making wine is long and slow. The fact that it has taken so long to make and involved so much sterilizing, washing and general fiddling makes every bottle special. If someone gives you a bottle of home made wine they must really like you.